A Soyuz rocket carrying a crew of three launches to the International Space Station on May 29, 2014. Former NASA administrator Mike Griffin thinks the United States' dependence on Russian technology to fly astronauts to the International Space Station is tantamount to a "hostage situation," according to an interview conducted in May. "Right now, our ability to get into space on our own power and with our own goods and services, we're in a hostage situation," Griffin told ABC News in a told ABC News in a video interview at the National Space Symposium. 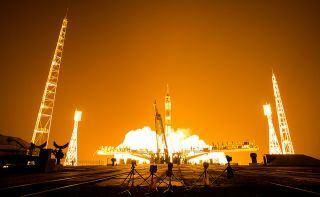 "If it wishes to do so, Russia can decide that there are no more Russian rocket engines coming to the United States and that no more U.S. astronauts will launch to the International Space Station. They can make that decision on their own." ABC News posted the interview on Monday. In March, current NASA administrator Charles Bolden said that the United States has quite a few options if Roscosmos, the Russian space agency, refuses to fly astronauts to the space station sometime in the future. Russia cannot operate the space station without the United States, according to Bolden. "Because we provide navigation, communications, power … I hate to deal in conjecture," Bolden said during a Congressional hearing on March 27. "The partners would probably have to shut the space station down. If you're thinking that the Russians will continue to operate the International Space Station, it can't be done."